How do fire and grazing interact in the Northern Great Plains? Burning in northern mixed grass prairie. Photo credit JD Scasta. 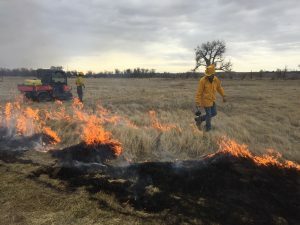 Researchers have been studying the interaction between fire and grazing in wetter ecosystems such as tallgrass prairies and savannahs for a few decades but understanding this interaction in arid and semi-arid ecosystems has not been well quantified until recently. Scientists from the University of Montana recently published a paper in the journal Rangeland Ecology and Management assessing the drivers and feedbacks of cattle selection relative to burned and unburned areas by measuring the strength of selection, plant biomass, crude protein, and vegetation structure/composition. The authors found that cattle preferred grazing in recently burned areas and that as the time since burn elapsed the preference faded. The reason cattle preferred these areas was a significantly higher crude protein level in burned areas compared to unburned areas. This higher crude protein level lasted about 120 days after the fire. 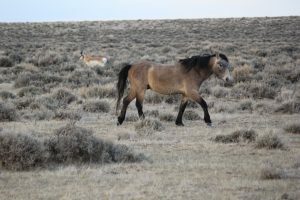 The effects of horse grazing in the riparian areas within the semi-arid and arid sagebrush steppe ecosystem has continued to be an issue of concern and federal scientists recently published a new paper in the journal Rangeland Ecology and Management. This study used exclosures in the Sheldon National Wildlife Refuge in northwestern Nevada from 2008 to 2013. Plots grazed by horses had 7x more bare ground, 60% less litter cover, and a basal cover index that was 65% higher. Density of rushes seemed to increase with grazing but density of sedges did not appear to change. Herbaceous stubble height decreased by up to 80% and visual obstruction of the vegetation by ~70%. The authors concluded that “greater vertical structure in excluded plots could improve hiding and nesting habitat for some riparian-associated wildlife species. Additionally, decreased bare ground with grazing exclusion could reduce erosion potential and susceptibility to invasive plant species.”. Researchers continue to investigate different formulations and deployment techniques for chemical contraception for feral horses to curb population growth rates. Recently, federal scientists published a study in the Wildlife Society Bulletin assessing the effectiveness of SpayVac® contraception. SpayVac® is an immunocontraceptive that has both PZP and an adjuvant. 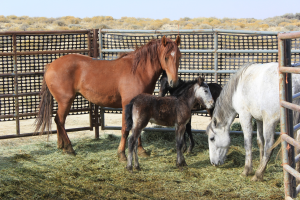 This study assessed captive BLM horses over a 3 year period following a single treatment with 30 mares in 3 treatment groups (untreated, nonaqueous treatment, aqueous treatment). How do feral horses affect pronghorn use and behavior around water? Pronghorn and feral horse in the Red Desert of Wyoming. Photo credit to JD Scasta.